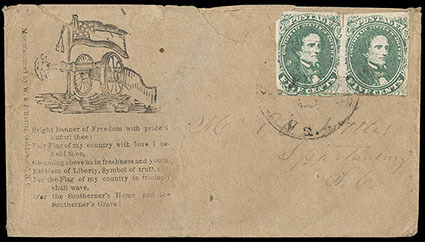 Confederacy, Cannon & Flag, patriotic design (Dietz type CN-3) with "Bonitz, Goldboro, N.C." imprint at left and verse below, on buff cover franked with 1861, 5¢ green horizontal pair tied by indistinct cds; stamp flaws and cover roughly opened at top affecting design, Fine. Confederacy, (Captured USA Patriotic Cover) "The War For The Union", postmarked "Red Clay, Ga., Jan 18" with "DUE 10" manuscript rate sent to Deals Mills, NC. from CSA soldier W.A. Roberts S8th NC, Company E, Palmer's Regt., some edge wear & staining, Fine. 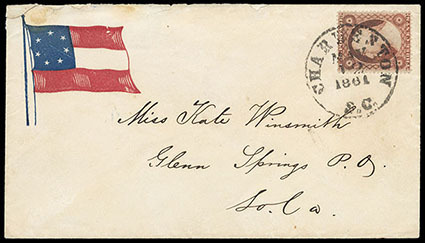 Confederacy, (Flag) 7-Star Flag, red, white and blue patriotic design on cover franked with United States 1857 3¢ Dull Red tied by "Charleston, S.C., May 12, 1861" cds and addressed to Glenn Springs, So. Ca., trivial corner tear at top left, flap missing, still Extremely Fine. 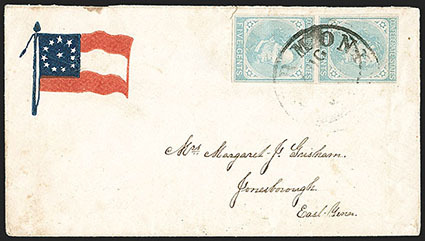 A STUNNING PATRIOTIC COVER USED DURING THE THE PERIOD PRIOR TO THE OFFICIAL FORMATION OF THE CONFEDERATE POST OFFICE. The war between the states created emotions of the greatest intensity in both the south and the north, and production of envelopes to express these feelings of patriotism were created. 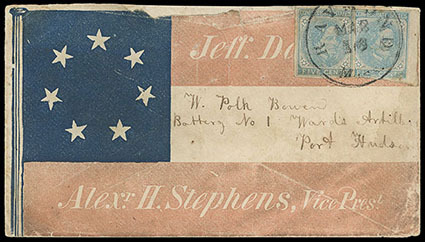 Some Confederate patriotic envelopes were made in the north, especially the earlier ones such as those with 7 Star Flags. Confederacy, (Flag) 7-Star Flag, red and blue allover patriotic design with "Jeff Davis, Prest., Alex H. Stephens, Vice Prest." 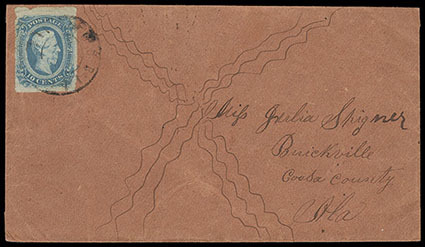 in stripes, on cover to Cincinnati, O. with manuscript "Sweetwater Tenn, April 11/61" postmark, franked on reverse with a U.S. 1857 3¢ dull red tied by pen cancel; faulty, Fine appearance, quite likely a unique usage of this rare Confederate Patriotic in Tennessee a month before secession. C.S.A. Catalog No. F7-1B. Confederacy, (Flag) 7-Star Flag, red and blue allover patriotic design with "Jeff Davis, Prest., Alex H. Stephens, Vice Prest." 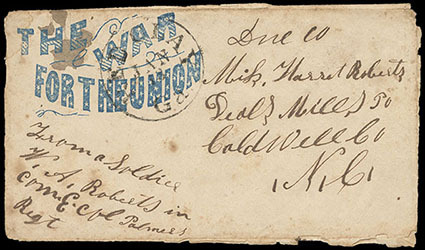 in stripes, on cover to soldier in Ward's Artillery at Port Hudson, La., franked with 1862, 5¢ blue, two singles tied by "Raymond, Miss., Mar 16" cds; cover missing backflap and small piece of edge at top, Fine, a very rare late usage of this patriotic design. C.S.A. Catalog No. F7-1B. 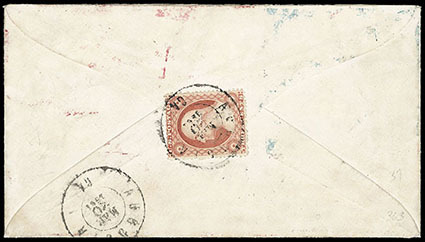 This cover was sent in 1863, six days prior to the Siege of Port Hudson, which was the final engagement in the Union campaign to recapture the Mississippi. Confederacy, (Flag) 7-Star Flag, red and blue allover patriotic design with small Gow imprint and large stars, on cover to Boston, Mass., reverse with U.S. 1857, 3¢ dull red tied by "Augusta, Ga., Mar 20, 1861" cds with second strike alongside, Very Fine, ex-Kimmel; with 1976 P.F. certificate. C.S.A. Catalog No. F7-2A, Imprint 12. Scott No. U.S. 26 Estimate $750 - 1,000. A WONDERFUL USAGE OF U.S. STAMPS USED IN THE CONFEDERACY ON A CONFEDERATE PATRIOTIC TO THE NORTH. 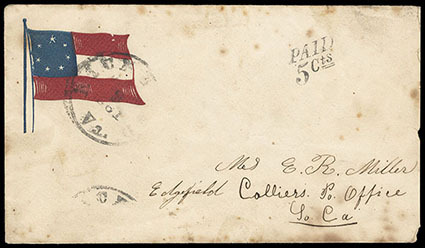 Confederacy, (Flag) 7-Star Flag Extended With Three Loops, red, white and blue design on cover with "Richmond Va., Jul 9, 1861" cds and matching "Paid, 5 Cts" rating handstamp to Edgefield Colliers P.O., S.C.; reduced slightly at right, some tone spots, Fine. C.S.A. Catalog No. F7-18 Estimate $250 - 350. 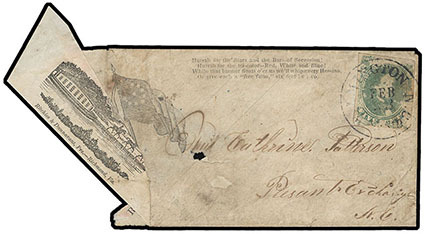 Confederacy, (Flag) 11-Star Flag and Verse Patriotic Adversity Cover, fashioned from illustrated canal boat shipping document franked with 1861 5¢ green (#1) tied by "Wilmington, NC, Feb 13" to Pleasant Exchange, NC., both stamp & cover defective, Very Fine and rare. 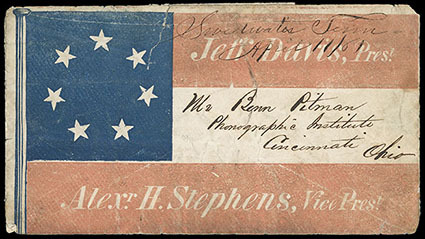 Confederacy, (Flag) 12-Star Flag, red and blue patriotic design on cover bearing 5¢ Light Blue, De La Rue (6) vertical pair, full to large margins except just in at top, tied by "Richmond Va, Aug." cds to Jonesborough Tenn.; tiny tear at top of cover, Very Fine and scarce, ex-Murphy. C.S.A. Catalog No. F12-3 $2,000. 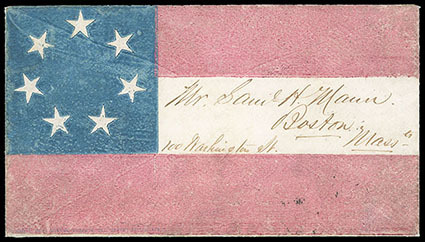 A CHOICE EXAMPLE OF THIS SCARCE CSA 12-STAR FLAG PATRIOTIC DESIGN. Confederacy, (Flag) Home Made Battle Flag, hand-drawn Confederate Battle Flag Patriotic cover franked with 1863 10¢ blue tied by Mobile, Ala double circle postmark and sent to Buickville, Ala., docketing on verso of cover reads, "Death or Liberty", Very Fine, Hand drawn patriotic covers made by soldiers are very scarce and are considered folk art by many.